I recently acted as a judge for the Romance Writers of America Kiss of Death Chapter’s Daphne du Maurier contest. It was a huge responsibility and a great experience. This novice didn’t sit on that judge’s bench without proper instruction, however. I received a packet of how-to-judge-this-contest documents, but even they didn’t allay all my fears. After all, I was getting ready to JUDGE a brand-new writer’s hard work, a story someone had worked on for months . . . maybe years. And I knew what these writers must be feeling because I felt the same anxiety when I entered my first RWA contest . . . and flunked out. One judge wrote that she felt like throwing the pages against the wall when the story didn’t end as the accepted rules for a romance said it should (sigh). When as many as thirty pages of manuscript from each of three unpublished writers arrived in my inbox one day in March, I stared at the computer screen for several minutes before I was brave enough to download them. Judging was going to be an intense process, and I had a deadline to meet. My objective analyses would require several read-throughs because I was bound and determined to be fair and not let any personal biases affect my scoring of these entries. The writing world is brimming with rejections, and writers have to be pretty thick-skinned to entrust their work to strangers. However, those how-to-judge pages reminded me that new writers are especially vulnerable to criticism. I tried really hard to balance my comments on the things done wrong with praise for the things done right. I hope I was successful in not bruising any of these writers’ egos. I also hope that someday I get to read their published works. The Kiss of Death Chapter of Romance Writers of America will announce the winners of the 2014 Daphne du Maurier Awards for Excellence in Mystery/Suspense at their “Death by Chocolate” extravaganza party on July 24. Now, that very long sentence is like trying to put ten pounds of potatoes in a five-pound bag. I probably would have had trouble with it had I seen one it in one of the entries I judged. Flash challenge: There must be a better way to say all that . . . write it up and send it to us. 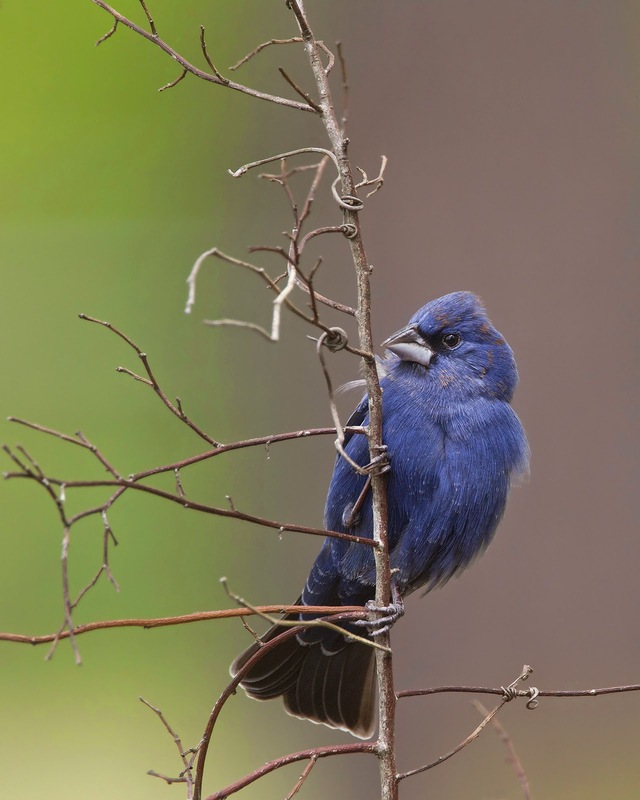 The blue grosbeak stopped by my backyard earlier this week. The little puffball is a little wind-blown, don't you think?